The Tujia Ethnic Minority is the 7nd Largest Ethnic Minority Group in China. The Tujia Ethnic Minority is among the larger minority groups in China. To be more precise; with a total number of well over 8 million today (8 million 28 thousand and one hundred in the year 2000 census), the Tujia rank as the 8Th largest ethnic groups within the Peoples Republic of China. Among the general traveling public they are also among the more well-known groups especially due to their much featured traditional architecture, traditional dance and folk costume which can include an elaborate head dress. The Tujia people are especially known for wearing colorful brocades. Tujia brocades are among the 3 top brocades manufactured among ethnic groups in China and celebrated accordingly. The original homelands of the Tujia are rich in natural beauties and dramatic landscape making them interesting to visit places and areas for both National and International Tourists. It may be noted that the Tujia Culture and styles resemble those of other ethnic minorities, which is in part due to the similar environments that these occupy. In the case of the Tujia, they very much resemble the well known Chinese minority group of the Miao peoples, to whom they are closely related. In fact, within the Peoples Republic of China, the Miao and Tujia were not viewed as separate peoples until they year 1954. Although the Tujia are celebrated as a separate culture and one of the Nationalities (ethnic minorities) of China, historically living in the central regions near the Yangtze River, they have a long history of integration with other parts of the Chinese nations, and in many ways their culture has adopted Chinese styles. Nevertheless, perhaps remarkably, after many centuries of integration the Tujia still retain many original cultural features including their very own language, a form of the Indo-Tibetan Languages. 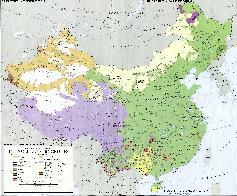 Their language is said to resemble that of the Yi People. Having developed no script of their own, the Tujia People have gradually adopted Chinese characters for their writing system. Especially after 1949, when in the "New China" was established a new era of advancement opened for the Tujia People. In the Peoples Republic the Nationalities, as they were then still named, were registered by number for the first time, their language was put over into Chinese script and a Government system of education was established among the villages. Ever since the Tujia have become literate being educated in Chinese script. The new form of Government mindership thus established has even translated into the name of the Tribe as known today. That is, the term Tujia is strictly a (Han) Chinese term, which in the past has long been known to have a derogatory meaning. The Tujia will therefor prefer to address themselves as Bizika, Bizka, Tuding, Tujen or Tumin People. Tujia is strictly a term used by outsiders, who usually have acquired their information through Chinese hands and mouths. Traditional crops are rice, weed. Sweet potatoes, potatoes and maize arrived only in the 18th century. Other produce include beets, ramie, cotton, tung oil, tea and oil tea. Although the tradition of making tea from the leaves of the moyeam tea likely existed for much longer among the Tujia People, the true fame of moyeam tea of the Tujia was established when it was given to the King of the Tujia minority as a present that was claimed to cure diseases in the year 1385 AD only a few years into the long rule of the Ming Dynasty over China. Apparently being well received, the tea became known "heavenly tea" and then went on the become a basic element in Tujia Traditional Medicine and village life. Many years and a full Dynastic period later, moyeam tea was still a well proven health product which was readily and uniquely identified with the Tujia People. As such, in the year 1837, during the Daoguang Reign period of the Manchu Qing Dynasty, it was the product selected to be given to the Emperor of China as a present from the Tujia People. Naturally, only the best of the best would do. To the considerable blessing of the Tujia People, the Daoguang Emperor absolutely loved this exotic tea and thus showed to hold the Tujia in high regard. However, as the Emperor Daoguang was overly pleased, he soon declared to have found that the tea had amazing health effects. It is unclear if this was the intention, but subsequently, the Tujia product of moyeam tea was in effectively "nationalized", as by Imperial Decree the trade in moyeam tea was to be monopolized, and the use of moyeam tea exclusive reserved to the Imperial House of Qing. The decree lasted until the death of the Daoguang Emperor at the Yuanmingyuan Summer Palace in Beijing and the outbreak of the "First Opium War " in 1850. Although the moyeam plant (Ampelopsis grossedentata) can be found distributed across the southern Chinese Provinces and is also found in neighboring countries, the cultivation and use of moyeam tea (Chinese: 茅岩莓 ; mao yan mei) is local cultural trait which is only found among the Tujia People in China (P.R.C.). Therefor, although the plant Ampelopsis grossedentata is far from rare, today the tea is only grown and processed as tea and health product within Tujia ethnic enclaves in the Zhangjiajie City Prefecture in Hunan Province. Except for the growing of this herbal plant, the production process involves plucking, withering, a delicate process of rolling and then the fermenting the leaves. According to the centuries old knowledge of the Tujia, the fresh leaves should be withered within five hours to avoid oxidization and loss of nutrients. After the proper withering has taken place, the rolling step produces the distinctive "white frost" color of ready moyeam tea. As with other teas, the rolling process enhances the flavor as it leads to a better and more even process of fermentation. After the fermentation has produced the correct taste and coloring, the tea is dried to be readied for storage and later use. The most important Tujia festival is the New Year, which always falls one day earlier on the lunar calendar than the New year celebrated by the majority Han People ('Chinese New Year'). The Festival of April the 8th is a festival celebrated by many ethnic groups in Guizhou Province among whom, the Miao People, the Boya People and the Tujia. The most spectacular way to celebrate this day is found among the Miao People of Guiyang and area, who for the occassion hold a mass gathering at the Fountain Square in the center of Guiyang City, the Capital of Guizhou Province. According to legend, the festival commemorates fallen Miao Warrior heroes who are supposed to have been buried in grounds near the square centuries ago. From the earlier Miao festival has grown a mass gathering of ethnic groups which now also include the Tujia, Boya, Dong, Gelao, Shui, the Zhuang and others. Ethnic costumes abound, there is song and dance, acrobatics and martial arts, all accompanied by the traditional instruments of the ethnic peoples. These are mainly flutes and horns, some of which can be as long as 7 meters. The Tujia have their own spoken language which has no written version. Today the Tujia language is only spoken fluently in a few places in China, most villages within Xiangxi Tujia and Miao Autonomous Province, the Tujia Autonomous part of Hunan Province. Due to the lack of a Tujia script and enduring contacts with the majority Han, all Tujia use Mandarin Chinese as their written language. The Tujia homes have their own distinct architectural styles. Tujia homes are wooden structures built on poles in order to protect them from the flash floods of the monsoon season, which are frequent in their native regions. Traditional farmers dwellings, which were the housing for the majority of the populace, are usually constructed of easy building materials such as thatched roofs and woven bamboo walls and floors, and do not have many adornments or decorations. Special buildings such as the homes of rich landowners, instated officials and tribal chieftains are more elaborate and have tiled roofs with upturned eaves which are internally supported by colums which are usually richly decorated and hand carved. Multiple stories are possible with ethnic specific features apparent in structures such as the quasi- pavilion, suspension peripheral columns, double-beams, stool-pillars, and huge roof, balcony and cornices. More general architecture unique to the Tujia People is often seen displayed in tourist advertisements and Tujia Bridges, Towers and Town Halls rank among the major architectural heritage of these people. The Tujia traditional dress is made of brocade and features mainly bright red and blue colors. Colorful embroideries decorate the edges and lining of the garments. The Brocade produced by the Tujia is considered to be of the highest quality found in the world, hence the cloth is not only used by the Tujia themselves but has throughout history been traded to neighboring tribes and sometimes beyond. The General History of the Ming Dynasty calls it "striped cloth." In the Song Dynasty they called it "brook cloth" and "brook-cave facing.". Tujia brocade is made by waist weaver. It takes yarn as warp and silk as weft. The weaving method is "interweaving the intermittent warp and incessant weft." The traditional Tujia religious beliefs are polytheistic, or perhaps better said: naturalistic and/or polytheistic. Apart from this the Tujia practice ancestor worship. As recorded by Chinese (Han) historians many of the Tujia worshipped the mountains and trees they lived among and also worshipped rocks. Their sacred animal was the (South China) Tiger (functionally extinct) especially the white tiger as, at least according to an orally transferred early legend found in the northern Tujia Language zone, an early ancestor was transformed into a white tiger thereby becoming the protector God of the Tujia race. The worship of the white tiger among the Tujia lasted well into the era of the New China ( Peoples Republic of China), as did other "primitive traditions". As did native tribes across the Mongolian Steppe and in the mountains of Manchuria, the Tujia practiced naturalist beliefs they also had Shaman Priest, the duty of whom was to relief suffering, do healings and warding off of calamities. These Shaman (Tulaosi) however no longer exist among the modern day Tujia. Another form of belief or religion found among the traditional Tujia is the belief in a triad system of deities named Peng, Tian and Xiang. In the system the 3 deities represent ancient ancestors, ritual family fathers, who are enshrined to protect the family and its values. In the 1920's some Christian Protestant and Catholics built Churches and own converts among the Tujia and other ethnic groups of the Wuling Mountain (Wulingshan) regions. However, any converts made or their offspring were heavily suppressed during the entire Mao Zedong Era (1949-1976) with no Christian culture surviving. There is no information on the current status of the Christian faith among Tujia or other local groups. Unlike the Han Chinese, Tujia generally did not and do not believe in sprits or ghosts. It is not a belief of the Tujia that the spirits of dead people may wander, or cause trouble. Therefor, in traditional villages the cemetery may be found close to or even within the village or town. Before the year 1949 some Tujia did copy the Han Chinese practice of using spirit tablets. However, due to Tujia beliefs the ancestral tablets were not thought to actually hold bond with a factual spirit. All such traditional customs were heavily suppressed during the cultural revolution era and as such, the custom of using ancestral tablets no longer exists among Tujia. The most important Tujia festival is the New Year, which always falls one day earlier on the calendar than the New year celebrated by the majority Han People ('Chinese New Year'). In most other ways, the Tujia have come to adopt the general festivals of the majority Han people of China. In a Nation in which generally speaking the suppression of ethnic cultures and their integration as Mandarin speaking Chinese citizens led in a nation by a Han majority was the norm, not much is told about the history of the Tujia People. Regardless of the below described general line of the history of the Tujia it is known that their unique form of brocade weaving was already popular among the gentry and Palace nobles of the Qin Dynasty (221 BC - 206 BC), which was Chinas 1st centralized Imperial realm. During the succeeding Han Dynasty (206 BC - 221 AD) era the brocades of the Tujia remained popular, hence we know of the existence of Tujia people already before and after the birth of Christ. What is otherwise known is that there are several conflicting versions of the origin of the Tujias. Some say they are the descendants of the ancient Ba people, ahistoric group of people non-experts and odd travelers have never heard about. ; Other versions of Tujia history claim that the people come from the Wuman, who moved to western Hunan from Guizhou Province; yet another tale claims that the Tujia came from the lower reaches of the Yangtze River in Jiangxi Province in the east at the end of the Tang Dynasty (618-907). Version differ according to regional group and local community and not historical proof can be retraced so far. What is agreed on however is at some point in the 10th century the Tujias had develloped into a distinct ethnic group which mainly lived in western Hunan Province. Historians hold this point to be the early Five Dynasties period, around the year 910. After early contact with Han People and their powerful and advanced culture, they developed metal smelting and commercial crafts. As it is given by Chinese Historians tells that history continued when Han peasants migrated to western Hunan in the early 12th century, bringing with them modern tools and farming expertise which, in time, were transferred to the Tujia. In western Hubei, feudal lords sold some of their lands to Han peasants and business people, some of whom became landlords. The feudal lords also commanded the economy. So the Tujias were exploited by their own chieftains, feudal lords and Han landlords. In historic terms the Tujia people traditionally lived an agricultural lifestyle, which however in their mountainous sub-tropic environment was supplanted with fishing, hunting and gathering of fruits, fungi and medicinal herbs. The ancient Tujia, those who lived up to the 18th century, were poor people who operated only small farms with small terraced pads reaching along hillsides, the operating of which required considerable labor. As the Tujia further integrated economically with adjoining regions the lifestyle of hunting and fishing was gradually replaced by a tradition of agriculture and animal husbandry. In addition to their agricultural activities, the Tujia also developed as handicrafts makers, with Tujia brocades and previously embroideries being regionally traded. Other traditional Tujia goods include tea and tung oil, both of which retain a position as crucial cash crop for the regions where Tujia live today. Last but not least the home territories of the Tujia in Central China offer a rich semi-tropical climate in which medicinal herbs and healthy minerals are found in abundance. As recorded by historians, the 18th century brought new agricultural crops to the Tujia homeland, specifically potatoes and sweet potatoes. The success of these new agricultural crops resulted in a population boom among the Tujia, who generally however remained poor. Changes in the relation with the rest of the Chinese Nation and Empire during the rule of the Manchu (now a dying minority) over all of China in the Qing Dynasty (1644 AD - 1911 AD) brought the Tujia administrative changes and the traditional Chieftains were replaced by local and regional State officials and the creation of a large group of elite capital and land owning Tujia who thrived on influence and trade. 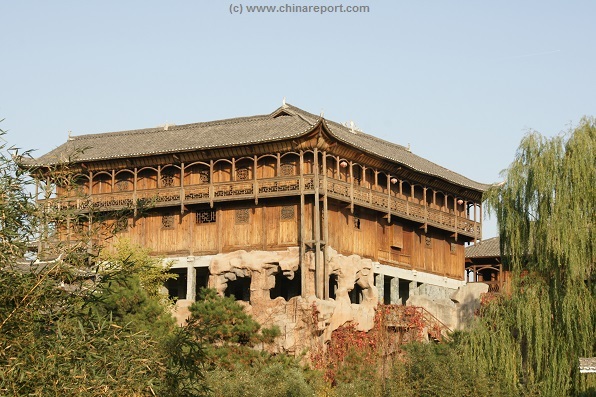 It was in this time that some of the greatest remaining Tujia architectural wonders were built. As gradually, the overland tea trade with Mongolia and Russia beyond developed the Tujia also became involved in tea trade. The Tujia are specifically known to grow Moyeam tea vines which are renowned for their health benefits. Another Tujia product is pressed oil tea also identified as pounded tea. A New Era arrived in 1949 AD with the establishment of the Peoples Republic of China, however it was not until the 1970s that new agricultural modernizations, mainly in the form of fertilizers and pest control, once more increased production in the Tujia lands. Even today, agriculture is usually practiced on small terraced strips of land in the foothills and valleys of the Tujia homeland, much as has been done for centuries. In modern day China, the Tujia economy is also largely based on tourism and income from hotels, restaurants, sales of handicrafts, brocades, embroideries and such have skyrocketed due to a continuous passing of tourist from other Chinese Provinces and Cities as well as foreign Nations. in addition, with a rising and further developing middle class in China sales of Tea are up, giving the Tujia yet another source of steady income. Although no specifics can be given, the living standard in the previously remote villages of the Tujia have risen remarkably, as they have in other regions of the Peoples Republic. Better road access and the opening of airports have simplified travel within Tujia territories and communications with the Nation beyond. Ever since the appointment of Xi Jinping, the "President" who's hometown of Zhangjiajie (Zhang Family Homeland) lies among the territories where Tujia People have their homelands, the tourist crowds have truly re-discovered Hunan Province, the Wuling Mountains, the revolutionary sites (Mao Zedong's place of birth) and the Tujia. A tour of the Wuling Mountains, the mountainous homeland of the Tujia rank top on the list tourist destinations within China today. Much of the traditional lifestyle of the Tujia has been sacrificed to modernity but the Tujia Culture remains strong within the ethnic enclaves of Hunan Province and Hubei Province. As elsewhere, the growing tourism industry provides an opportunity for the preservation of ethnic skills and products that might otherwise have been lost. Traditionally women had a very low status, even when compared to general life in China and the traditional customs of other minorities. Not only were women required to perform household jobs, in addition they were expected to take part in agricultural labors. Up until well into the 20th century women usually married into arranged marriages, taking them away from family and village life to be transferred to the new world of the husband and his family home. One of the legacies that remains of this aspect of former Tujia life is the custom of the "cry wedding". The custom of cry wedding relates to the pain, sorrow and uncertainty a new Tujia bride would face when getting married. Therefor, for the female, Tujia weddings are not necessarily about festive moods but on the contrary, also pay hommage to the change aspect of the marriage. In current day tourism settings, the "Cry Wedding" is usually related through a stage drama. It can be performed by one woman, but is usually shared among more women. Traditionally the Tujia way of life includes lots of community song and dance. Among the main dances preserved today is the hand-waving dance, which is often performed for visitors and tourists. Among the Tujia Dances are two important dramas, the Maguosi and the Nuo. The Maguosi is a sacrificial drama performed by up to 15 or 16 Tujia dancers which are dressed up with leafs and straw to resemble ancient primitive people. The drama, full of song and dance, is a reminder of the close relation the Tujia have with their ancestors as well as the surrounding natural habitat. The Tujia started their process of integration well over a 1000 years ago, if not earlier. Serving as fierce fighters and mercenaries during the Ming Dynasty Era (1368 AD - 1644 AD) , when they reached their highpoint of political power within the Imperial System, the Tujia are nevertheless basically a mountain farming people scattered among valleys in extensive regions of central China near the Yangtze River. The Tujia regard not the Yangtze but the Youshi, Fengshui and Qingjiang River valleys as their homeland and the Youshi River as their mother river. Although their native regions were originally larger and more easily demarcated up to as late as the second half of the 20th century, today in a situation with elaborate infra-structure, the majority of the Tujia are either scattered or found living close-knit ethnic communities in Hunan Province and Hubei Province in Central China. The main ethnic communities in which people still retain a resemblance of the traditional historic Tujia lifestyle are the Xiangxi Tujia and Miao Autonomous Province of Hunan Province and the Enshi Tujia and Miao Autonomous Prefecture in Hubei Province, regions which are therefor regarded as popular tourist areas. That said, as time goes by, the traditional way of Tujia life is disappearing, as it is in other minority territories. Apart from their homelands along the Qingjiang River Valley, the Tujia are found in communities scattered across ethnic autonomous counties in western Chongqing City Province, these being the Xiushan Tujia and Miao Autonomous County, Xiyang Tujia and Miao Autonomous County, Qianjiang Tujia and Miao Autonomous County, Pengshui Miao and Tujia Autonomous County and Shizhu Tujia Autonomous County. Tujia also reside in western Hubei, Southern Hunan Province, Sichuan Province and a small group can be found North Guizhou Province as well. The groups in Guizhou are found living within Yinjiang Tujia and Miao Autonomous County and Yanhe Tujia Autonomous County in the north of the Province. Geographic overview of Guizhou Province. The Map includes border areas of neighboring provinces and regions. 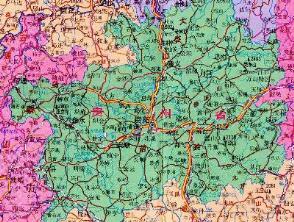 This Map Includes Main Cities and Towns (shown by size), Main Monuments & Landmarks of Guizhou Province, the location of many Minority Comunities, main rivers, lakes and waterways, Mountains (with Height), major highways, provincial railroads and main railroad-stations. This Map further provides links to on site photos and information on the Cities and Monuments. The most famous Tujia architectural wonder is the world record longest wooden wind-rain bridge which is a 288.8 meter long bridge spanning the Qingjiang River in Xianxi Tujia and Miao Autonomous Prefecture in the Tujia homeland in southern Hunan Province. This bridge is altogether more than 40 meters longer than the more famous Longjin roofed bridge of the Dong Minority(recently burned by fire) in roughly the same regions and at first glance similar in appearance. The Tujia bridges however contain more wooden elements as one may find upon closer inspection. 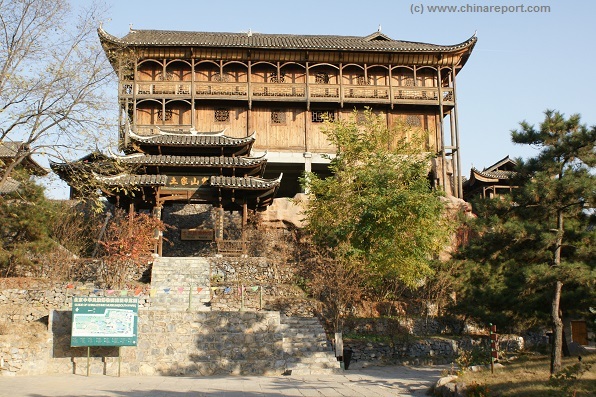 Another famous Tujia architectural wonder is Wangcun Village, a Tujia Village with over 2000 years of history situated along the Youshi Mother River of the Tujia People. Popularly renamed to Furong Town after a succesful Chinese Film entitled "Furong Town" was shot in the village it is now a popular travel destination. Surrounded by lavish green hills and mountain peaks the small town sits along the Youshi River at some 51 kilomters from the county town of Yongshun, center of Yongshun County, also in the same Xianxi Tujia and Miao Autonomous Prefecture in Hunan. Apart from a 2.5 kilometer long central road, the city features Tujia Minority Ethnic Housing to visit as museum plus is the home of some of the great Tujia historical relics, in case a copper (stele) dating a treaty between Tujia and Han to the year 940 AD. As the Tujia historically had no written language, in modern China the object known as the Xizhou Stele is taken as among the earliest relics dating and relating Tujia history and is regarded as a sacred totem by the Tujia. As the former port city and trading center of Yongshun County, the town of Wangchun (Furong Town), also gives access to the popular Mengdong River waterway tour and the south gate of Mengdong River scenic spot. Other Tujia architectural wonders in the form of traditional stilted housing organized in original grouped form remain in Peng Family Village (Pengjia Xiang) in Xuan’en County in a remote part of western Hubei Province, having been constructed by Tujia Emigree groups originating from Hunan. A famed but more remote destination within Xiangxi Tujia and Miao Ethnic Autonomous Prefecture Pengjia Xiang Village, is regarded as the most pristine preserved form and last resort of original ethnic architecture. Replicas of Tujia Nationality architecture at the Beijing Minorities Museum, a part of the former Beijing 2008 Olympic Venues. The Tujia live in mountainous regions in Central China and hence Tujia traditional buildings feature almost fully wooden structures, intricately built with plenty of brackets, layers, wood carvings and other decorations. Although often similar to the building styles of neighboring minorities such as the Dong and Miao, the Tujia style is nevertheless distinct. During the Ming Dynasty (1368-1644), Tujia soldiers, together with Han, Zhuang, Miao, Yao, Mulam and Hui fighters, were sent to the country's coastal provinces to fight against Japanese pirates pillaging the areas. Their success as mercenaries and allies of the Han in an era of refound Han Chinese Nationalism and the cleverness of their chieftains not only earned them acceptance and a substantial number of powerful positions within the Ming Empire, it also allowed for a continued self identity and ethnic autonomy as the Tujia Armies were traded to the Throne by their chieftains in return for local control. Traditional Tujia handicrafts are Tujia brocades and embroideries. Women also produce woven handicrafts as bamboo and rattan baskets. Others: paper cuttings, paintings, wood carvings in particular flowers, wax printing. Some of the Tujia wax prints are remarkable and famous. The Moyeam tea from the Tujia People in Hunan is grown on a red sandstone soil which is said to elevate the amount of flavonoids. The moyeam tea plant is therefor not really a tea plant but a herbal medicinal plant which is rich in flavinoids, especially dihydromyricetin. In addition it is said to be rich in vitamins and healthy trace elements. No less than 17 types of proteins and some 14 trace elements can be found in the plant when fresh. When used the moyeam tea comes in two forms; the traditional Tujia white frost moyeam tea, which has a natural sweet taste. When not oxidized the taste is however different and tastes slightly bitter with a strongly sweet aftertaste; the slightly grassy flavor is somewhat different from other common teas in China. Traditional Tujia, which takes more time and effort to produce is higher in price than the unoxidized variant. A strong tradition among the Tujia People for many centuries and throughout China famous as a unique cultural heritage and brand of tea, the Tujia Moyeam Tea has been marketed some 20 years ago and since has found its own niche market among tea lovers. The regular consumption of moyeam tea is said to have various health benefits, the most striking of which is to be able to gain a very old age in remarkable fitness. Tujia People who have drank moyeam tea on a daily basis for their entire life frequently live into their 90s or become over a 100 years old. The other healt benefits are specifically; encouragement of healthy sleep, the helping of stomach ailments, protection of the liver, curing of respiratory ilness, regulation of systemic bloodflow and lowering of blood pressure. As if all of this is not enough, clinical trails and additional research show that the drinking of moyeam can help prevent prostate cancer and is a very helpful medicine for preventing prostatitis as well as enlargement of the prostate gland causing polyuria. Moyeam tea is available as loose tea, as tea in bags, or as powdered tea. There is also a growing line of moyeam related tea and health products available in the Chinese market. Among the neighboring minorities are the Dong and the Miao, the latter of whom may be regarded as a group with many similarities. Many Tujia therefor also speak or understand the Miao language. Naturally, with the modernizations of China occurring before and after the death of Mao Zedong, Tujia too have been modernized and a number of them have spread across the Nation. Especially in the most recent move of massive urbanization, many Chinese have left their villages to seek for a new life in the larger cities. Among them were also Tujia. Generally speaking traditional ways are practiced by an older generation. People who only speak the Tujia language are rare if not non-existent. The majority of Tujia are bilingual, speaking a form of Mandarin and then also the Tujia language. which remains strong. Other Tujia handicrafts such as paper cuttings, carvings and painting styles have lost relevance although many modern fans of the arts exist in China and beyond. In the national census of July 1990, there were 1,771,004 Tujia in Hubei Province; 1,794,855 in Hunan Province; 1,076,529 in Sichuan Province; 1,045 in Guizhou Province; and 37,026 in other areas, for a national total of 5,725,049. In that year the Tujia were the eighth largest ethnic group in the People's Republic of China (PRC). 20 years later in the year 2000 there were just over 8 million Ethnic Tujia living within the People Republic of China. Ever since the 1990s the number of Tujia has risen significantly, among things due to renewed pride in National Ethnic Identity. Where in the old communist China an ethnic identity might quickly lead to social stigma, in the new China with more individual freedoms more people were willing to come forward and identify themselves as a member of the Tujia Community. This trend has continued and in the year 2010 Census, 8 million 353 thousand 912 people regarding them themselves as ethnic Tujia were registered. Regardless however, except for Government statistics not much is known to the outside world of the general progress and/or plight of the modern Tujia. What can be found and told is summarized below.